A City Livery Company and Spotty Panthers or maybe Leopards. The livery company in question is the Worshipful Company of Dyers and leopards or even panthers are heraldic beasts. I actually think you’ll agree that the phrase ‘big spotty cats’ just about sums up these wonderful creatures. It looks as though someone under the age of ten has had a wild time with a paintbrush. Dying- and I think I’ve spelled that right- has been going on in London, so far as records are concerned, since the twelfth century but it was Lancastrian King Henry VI who gave the company its first charter in 1471. Given that this was not an auspicious time for the English monarchy it is perhaps not surprising that the following year the Yorkist King Edward IV dished out a brand new charter. 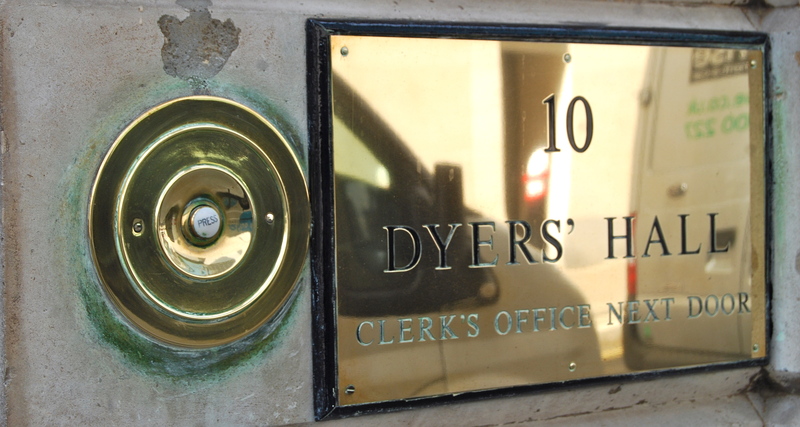 The dyers have had their headquarters of Dowgate Hill since Tudor times which means that this building isn’t the original one on the site – yes, the 166 Great Fire of London strikes again. But back to the coat of arms. The three corded bags on the shield are bags of madder – the plant used to produce a red dye. The motto, ‘Da Gloriam Deo’ meaning give glory to God. So far so good. From now on the explanation gets a bit more complicated. I have, of course, arrived at the two supportive large spotty red-whiskered cats. The Worshipful Company of Dyers describe them as panthers and they should know; after all it’s their coat of arms. There are three big cats in heraldry – lions, leopards and panthers…though tigers do turn up occasionally but let’s leave them out of the equation for the time being as things are going to get difficult enough as it is. As I understand it – and I’m not an expert on heraldry- if the cat is ‘passant‘ which means three feet on the ground, one paw raised and face turned to look at you – think cat stalking while pausing to have its photo taken- then its a leopard. This in turn raises some interesting questions about the three lions on the royal coat of arms and the famous three English lions of the football song. If the cat is standing on its back legs- rampant– then in medieval English heraldic terms it is a lion. Just to confuse matters even further in medieval terms a leopard was the offspring of a lioness and a panther. Thankfully I don’t have to try to work out the change from leopard to lion for myself. There is a very helpful article on the subject in the BBC History Magazine website BBCHistory Magazine Extra. Basically the leopards on the royal coat of arms turned into lions during the Hundred Years War – something similar, I expect, to the rebranding exercise carried out by the House of Saxe-Coburg-Gotha when they turned into Windsor during World War One at the point when links with Germany became somewhat uncomfortable. If you want to read the article click on the picture. Anyway back to our big cats – the red whiskers and red wavy dog like ears are neither whiskers nor ears. It’s flame. This turns our cats in to heraldic panthers incensed- and I think I’d be fairly annoyed if I started breathing fire out of my ears. According to the tattered remnants of my old heraldry book, this represents the very sweet breath of the panther. Apparently the heraldic panther is more of a mythical beast than a real animal and has its origins in Greek beliefs. The breath of the panther, as symbolised, by the flames, lures animals into its lair. You will be pleased to hear that dragons are immune from the panther’s breath and are afraid of panthers as a consequence where as every other animal goes traipsing off to the panther’s lair – possibly to be turned into a mid morning snack but don’t quote me on that because medieval sources couldn’t agree either, some of them have the panther down as an exceptionally gentle beast. I bet there was a lively discussion held by the dyers the following year when the Lancastrians were shown the door and it looked as though the Yorkists were triumphant. It just goes to show though that the streets of London, while not paved with gold, are knee-deep in history even if you have to do a little digging sometimes. This entry was posted in Fifteenth Century, Kings of England, Wars of the Roses and tagged Dowgate Hill, Edward IV, Henry VI, panthers incensed, three lions, Wars of the Roses, Worshipful Company of Dyers by JuliaH. Bookmark the permalink.